Apartment 3 is another stunning refurbishment following the enormous popularity of Apartment 7, the identical apartment on the floor above (ref 1982119) A 2-bedroom, 2-bathroom partment on the cliffs above the Harbour and North Beach, with spectacular views of both, the property builds on all the good things in number 7 with extra features for the discerning holidaymaker. To our first venture's Visit Wales 5 Star features we have added a much larger terrace, "wet central" heating and a more user-friendly ensuite bathroom configuration. And, accessed from street level but with towering height on the seaward side, it really does make the most of what Tenby offers - a charming and well-resourced town and wonderful, often breathtaking views of the coast on the other. Our first venture featured in WALES ONLINE - 21 One-off Places to Stay in Wales for a Truly Memorable Trip ! (31 August 2016 -http://www.walesonline.co.uk/whats-on/whats-on-news/21-one-places-stay-wales-11768767). Apartment 3 ups that level of quality a notch or two, in our view. Refurbishment finished at 3 Royal Victoria Court in May 2017 and we have had 100% 5 star reviews from all our guests since then. We have again modernised and refitted the apartment to our own standards for our own use, so it has all the conveniences of home, plus the Wow! of high quality fit-out, including two ensuite bathrooms and a superbly fitted and equipped kitchen. The apartment is a one-floor, two-bedroom accommodation in a large Victorian house perched on the harbour cliff in the heart of Tenby’s holiday area. At the top end of Crackwell Street, you’ll be ideally placed for access to the promenade, the pretty, postcard-view Harbour and Tenby’s three beautiful Blue Flag beaches. If you really do like to be beside the seaside, you are going to love staying here! 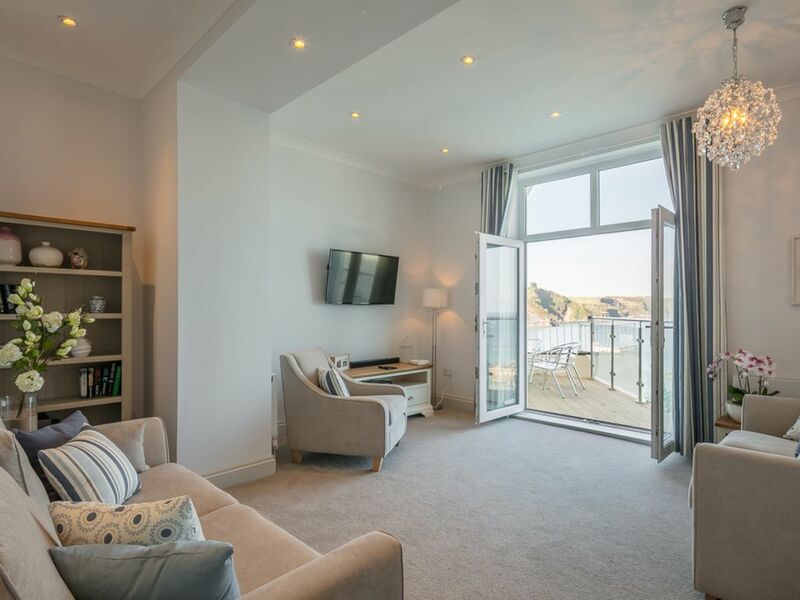 Sitting smack on the cliffs over Tenby Harbour, with immediate access to this lovely seaside town’s shops, restaurants, pubs and other attractions, the apartment has spectacular views over the Harbour and North Beach, across to Caldey Island and even beyond to the beaches of North Devon. The substantial open plan living/dining room has double doors accessing a modern and spacious terrace where you can sit and relax, soaking up the seaside ambience and the outstanding view, perhaps whilst enjoying a meal. It has an additional large bay window, with seating, filling the apartment with light and letting everyone enjoy that wonderful aspect. If you’re not down on the huge, soft-sandy beaches, Tenby has many other attractions, including daily (weather permitting) boat trips to the Monastic Caldey Island, or to fish or see other wildlife. Or maybe you fancy the climbing walls at the Overhang, on the slipway to Castle Beach? Tenby is well set within the Pembrokeshire National Park and offers a great base for exploring this beautiful coast and county, with its many leisure pursuits and attractions. As a family, we often visit the nearby attractions such as Manor House Wildlife Park (meerkats, Sumatran Tigers and all the rest) Folly Farm (Zoo, vintage funfair and loads of other activities), Heatherton (many children’s and adult activities, from excellent crazy golf, through water-zorbing and tree-top experiences, to archery, boating and driving activities for all ages). Or there is the theme park at Oakwood, if you really can’t bear another day just relaxing on the beaches and eating fresh-off-the-boat fish at one of Tenby’s many fine eating places, such as The Mooring or The Blue Ball. For a more sedate experience, castles at nearby Carew, Pembroke and Laugharne (Dylan Thomas’ home) are always well worth a visit, and offer many events. You must visit St David’s, with it’s historic cathedral. Tenby is on the Pembrokeshire Coastal Path so there’s plenty of wonderful coastal walking to be done. BREAKING NEWS; We've just refurbished our 12-sleeper clifftop house (Castle Beach) to the same luxury standard. Available to rent from 6 October 2017 - It has a separable Sleeps 2 flat as well! We are a couple of a certain age, with an 8-year-old daughter. We grew up respectively in Manchester and London and are currently living in Bristol. We both have Welsh parents and have long holidayed in Wales. We both have full-time occupations. A trip to Tenby has always been a seaside joy. It's mixture of old-fashioned charm and modern facilities provide both us and our daughter with all that we need for a great holiday break. Royal Victoria Court is classic Tenby - a lovely old building in which we saw potential to develop a beautiful apartment. We did and are letting it (number 7) very successfully. When the opportunity to do it all again came up for the identical flat on the floor below, with a much larger sea-view terrace and ground-floor access, we couldn't resist. The views are fabulous. The picturesque beaches are a delight and you are never more than a few steps away from the bustling restaurants and cafes in the town. The views (the building practically has it's foot in the sea) are absolutely to die for - we are still taking photographs from the terrace every time we visit. The apartment is in the best part of town near the best coffee shop, restaurants and shops, yet is waterfront too. "Wet" Radiators on Electric boiler system. No night storage heaters! Unlimited fast broadband on a private network. Street level access from town side, high above the beach on sea side. The second oven is combination oven and microwave, for extra convenience. Great views through bay window. Or sit outside on the large terrace to enjoy your meal. A small and varied selection of books is available and you are encouraged to swap like-for-like if there's something unputdownnable you simply must take away with you! This apartment is fabulous!Tastefully decorated, clean, and welcoming. It also has a great location near to all the amenities, with added bonus of having a balcony to enjoy the views. Communication with Jon the owner was excellent, he was very helpful. We look forward to a third visit! And we look forward to seeing you again! Many thanks for such a good review. We're really glad of the extra terrace/balcony space and the opportunity it affords both for indulging in the outstanding views and for al fresco refreshment. This is not our first time to this fabulous Tenby house and it won’t be our last. My top tip is to be up each morning to watch the sunrise from the comfort of the living room or the balcony. Always a great start to the day. The apartment has everything you need and is beautiful. Jon is always fantastic with his communication before and after the stay. Highly recommend to stay here as it’s brilliant and the location is ideal too. We will be booking again for another visit soon. The apartment was just as described on this site, warm, modern, high spec and with stunning views. We felt at home the moment we stepped through the door and whilst it is within a stones throw of all the shops and restaurants, it was blissfully quiet. The kitchen facilities were excellent and we had everything we needed to prepare meals when we weren’t eating out. The bathrooms were luxurious and my wife’s only complaint was that the towels were just a little too thick!! This was simply one of the best apartments we have stayed in and we can’t wait to return. That's such a lovely review - we're quite speechless! Thank you very much indeed. Come back soon! Nice spacious apartment, with stunning views over Tenby harbour. Only stayed for two nights, witch meant with the required late check-in and early check out, we only felt we had a one day break. A lovely place never the less. We wish you'd asked for some flexibility in check-out times! Our housekeepers do their absolute best always to accommodate such wishes, particularly in the off-season. We are always available to chat on the number supplied as well and advertise our willingness to take queries whenever. Ah well, next time, eh? We want all our guests to have five star memories! Our normal policy is 10am check-out, 4 pm check-in which ensure the team have time to clean properly on changeover days. Many thanks for a smashing review. We're delighted you enjoyed your stay and hope we'll see you again. Beautiful apartment with a view to die for. Thank you very much. And thanks for booking next year too!